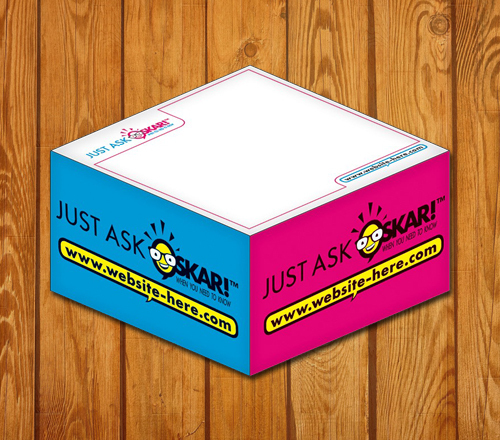 Custom 2.75 x 2.75 x 1.375 memo cubes - 4 colors, 1 design is sure to become an asset to your campaign and serve you above expectations. You can consider it for acknowledging your employees, workers, customers, clients and everyone else who matter to your business. It can be offered on several occasions such as tradeshows, corporate events, street fairs, in-store promotions and more. It suits all those big budget marketers and start up businesses, which are facing stiff niche competition and wish to raise high. Request a quote to know wholesale savings for these personalized 2.75 x 2.75 x 1.375 memo cubes - 4 colors, 1 design. * Price includes 4 standard colors screen printed SPOT and 1 side design. Sheet imprints offered on orders of 250 or more.